Integrity is the cornerstone of all success. It is your inner image of yourself; who you really are. 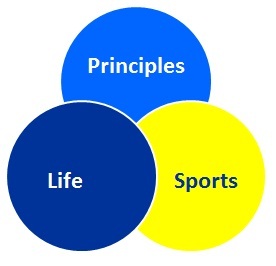 Know your values in life and behave in a way that is consistent with these values. Always be loyal to your beliefs and values. Live out your values in all areas of your life so that others can rely upon and trust you. Respect both yourself and others for it is a continuous cycle of appreciation. It is virtually impossible to respect others if you don’t respect yourself and to respect yourself if others don’t respect you. You must first respect yourself and then others will respect you. If you can’t respect yourself, no one else will be able to make that happen for you. You alone must begin to respect yourself. Self-respect is essential because it encompasses every aspect of your life and defines who you are to yourself. Accept who you are and everything about you; the good and the bad. Then respect and appreciate the individuality of other people and the ways in which he or she is unique. Your attitude is your choice and you alone can decide how to deal with the events in your life. You can not always control the circumstances around you, but you can always control your attitude and how you perceive your circumstances. Always keep a positive attitude because a positive attitude will help create your future instead of being held back by allowing negative feelings to affect your attitude and behavior. Realize that you alone are responsible for your future. You alone are responsible for the outcome of your efforts. Your background and circumstances in life may affect who you are, but you are responsible for what you become. Don’t look for anyone to blame. Take responsibility for everything you do or don’t do. Do what you know is the right thing to do and do it when it is the right time to do it. Have a dream in life that is so substantial it will challenge you to always be at your very best. Then develop a goal setting strategy to achieve your dreams. Start by having a clear vision of what exactly it is you want to achieve or become, and form a mental vision of this. After you have created your vision, design a plan of action, and break down the plan into small steps. Perform each act to the best of your ability, and with determination and purpose to reach your goals. Believe without a shadow of a doubt that you can reach your dreams and goals. Believe that you will be successful. Stay away from negative influences which make you doubt your ability to succeed. Surround yourself with people and things that remind you that you can and will succeed. Have the courage to become the person you believe you were meant to be. You have to have courage to achieve your goals. People sometimes will have an inspirational goal with a detailed plan for achieving it, but fail to ever put that plan into motion because they fear failure. All your goals and dreams can be achieved if we have the courage to pursue them. The commitments you choose to make define you as you. Your commitments communicate to the world what you believe is important. They determine your values, beliefs, and priorities, and ultimately define you as a unique individual and differentiate you from others. A commitment allows others to more deeply trust and respect you. Therefore, make a firm commitment to yourself and what you want to achieve. If you believe in yourself, and you are committed to achieving your goals and willing to put forth the effort, your dreams can become a reality. Success is mostly dependent upon effort and persistence. Typically, the person who works the hardest and puts in the extra effort will be the one to succeed. Do not give up until you have achieved what you desire. It’s not how much better you are that makes the difference, but rather how much effort you put into it. Give your dreams all you’ve got and you’ll be amazed at the rewards that come to you. Always seek to improve yourself physically, mentally, and spiritually. Continuous improvement is essential for growth. Everyday you should be accomplishing tasks which will ultimately help you become the person you want to become. See every failure as a stepping-stone to success and only as a temporary set back. Learn from your experiences and push on towards your goals. Achieve a little more each day than you think you possibly can, and you will expand and increase your abilities monumentally. The world is interconnected and lives are intertwined within the world. Unity encompasses helping, encouraging, trusting, sharing, and cooperating with others. Like single raindrops collect to build a powerful river, each individual is responsible for making the group complete. Whether it is with members of your team, family, community, or society, you should strive to build camaraderie and cohesiveness within the group. Qualities of generosity, loyalty, teambuilding, and selflessness will help build a unified team and help you understand that the whole is more than the sum of its parts. Life and sports are meant to be enjoyed. Enjoy the moments and enjoy the journey. When all is said and done, it’s not what was said or done that you remember, but the fun you had along the way and how it made you feel. If you enjoy what you are doing, you will be successful. You must remember that success is not the key to happiness, but rather happiness is the key to success.